Oops - we don't appear to have a video for the KV-S1058Y. Panasonic’s KV-S10Y Series of A4 network scanners deliver all the performance today’s business world demands, combined with the ability to connect directly to critical systems and networks. Ideal for small and medium-sized offices, along with enterprise environments, banks and financial institutions, medical offices and hotels, the scanners help businesses make the move towards fully digital working. The scanners can be used in three ‘push’ scan modes, meaning they can be operated with or without a PC or USB connection. Thanks to a preset scan function, if users register their scanning requirements in advance, they can scan directly to an FTP server, SMB folder or email. 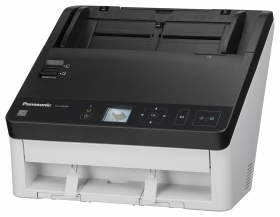 The KV-S10Y Series scanners also come equipped with a large-capacity automatic document feeder (ADF). The ADF makes them ideal for scanning larger batches, double-sided documents and paper capacity of up to 100 originals (80g/m2). To minimise interruptions to scanning performance, the KV-S10x8 Series scanners feature intelligent double-feed detection. That means the positions and lengths of labels, vouchers and photos can be memorised to automatically disable double-feed detection for documents in the same format. We understand that your business handles documents in all shapes and sizes – and you don’t want the inconvenience of having to scan each format individually. So the KV-S10Y Series scanners can scan passports, embossed cards and long paper, along with mixed paper and hard card for batch scanning.